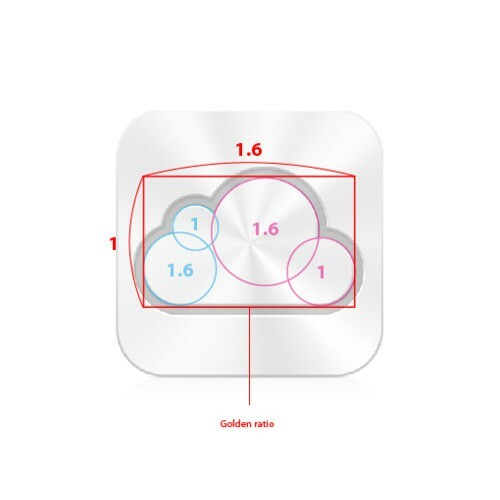 Neat spot by Alam van Roemburg: the iCloud icon uses the Golden Ratio, which has been thought since the 16th Century to lead to pleasing, harmonious proportions in aesthetic design. How do you use the Golden Ratio to design some harmonious icons? Let’s say you want to draw the perfect rectangle. Using the golden ratio, what you’d do is draw a perfect square, then draw a line through that square. Now in the top half of the square, draw a diagonal line from the lower left corner to the upper right corner. If you then moved that diagonal line like an hour hand from the upper right corner to trace an arc above the square, the highest point of that arc is the rectangle’s ideal height according to the square’s golden ratio. Although the Golden Ratio was first identified back in the 16th Century as the one most likely to lead to harmonious design, it was first identified by Euclid back in the 3rd Century B.C., who famously described it as an “extreme and mean ratio” worthy of no small degree of respect. Pretty cool, huh? Still, no surprise given Apple’s attention to detail, and in fact, Cupertino’s not the only tech company to prominently use the golden ratio in their products: Twitter’s new design also conforms to the Golden Ratio. Still, pretty neat! Update: Looks like Alan was alerted to this neat fun fact by this cool Japanese blog post, which was the original source.